We Be Reading: One Week 'Til Read-a-Thon Time! One Week 'Til Read-a-Thon Time! 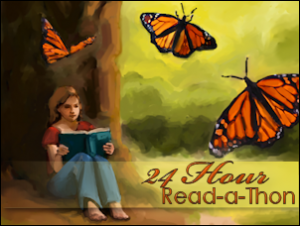 We're one week away from the 24 Hour Read-a-Thon, a.k.a. Dewey's Read-a-Thon and I've signed up to participate again this year as a reader. I never know what my schedule will be or how many hours I'll actually end up reading but I will try my hardest to read as much as possible with a husband and kid around. One of these times, I'll do the whole hotel room getaway thing! So, I'll see you at 5am Pacific (though more likely a bit later as I'm not a morning person) on Saturday, October 22nd! I will probably write a couple of blog posts during the day but will be mostly on Twitter. You can see my tweets in the sidebar if you're not a Tweeter. I enjoyed Affinity, I've not read the others on your list. But I admire your stamina - not sure I could do a straight 24 hours reading. 5am is too early! It starts at 9am for me and that's pretty early for me. I am impressed you have your stack already. I have some ideas but I haven't compiled my stack yet. Tracy - A big part of it is picking the right books. They have to be light, quick reads. I'm using this as a chance to clear some books from my TBR! But I think I end up reading for maybe 15-17 hours? Lola - Yes, I highly doubt I will be up at 5am. And I have my stack set already because my TBR shelf is by my bed and so I'm constantly looking at my books and I know which ones would be right for a read-a-thon! I'm so excited for the Readathon! It's one of my favorite community events. Someday I'll do the hotel getaway thing, too :-) The event starts at 8am for me (EST), which is great for the morning but makes staying up until the end nearly impossible. I usually crash with four or five hours left because I'm doing more nodding off than actual reading. You have some great books on your list! Glad you are able to do it. I'll be thinking of you guys … and I'm curious about the Ness book! I want to read it too … cross over for us!! Erin - I usually make it almost to the end here (maybe until like 3 am) but I could never do the full overnighter! Great pool! Gotta love Diana Wynne Jones, Eva Ibbotson and Scott Westerfeld. And I'm a bit jealous of your early starting time. I start at 7, which is great, but I'd rather start early and be done early so I can crawl back in bed (though I'm not attempting 24 hours). Enjoy the reading! I've heard great things about A Monster Calls.